Kokeshi are Japanese dolls traditionally made from wood. 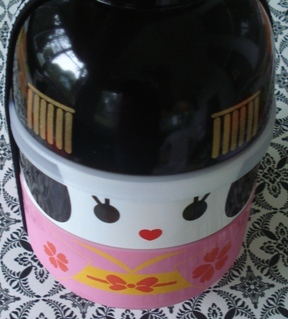 I was excited to win the Kokeshi Bento Box Giveaway hosted by Shirley of Bento Singapore. (see below for an image of this adorable bento box) Shirley is very talented and features amazingly cute bento creations on her blog. 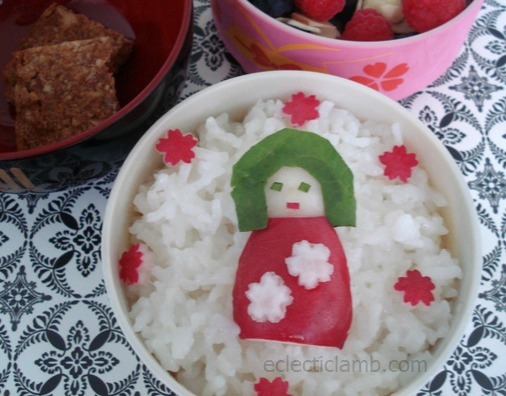 In honor of my first time using this bento box, I decided to make a kokeshi doll out of radish and spinach. This entry was posted in Bento / Cute Food, Food and tagged bento, japanese bento, lunch, vegan. Bookmark the permalink. I like it, she is so cute! Very sweet love the radish! Ahhh! I just saw this box on Amazon! Let us know what you think! I like it! It looks so cute and can pack more in it than I thought. The strap is nice. You can not fit a lot in the bowl but some people pack a package of something they can add hot water to such as soup. I was able to fit pieces of granola bar in the bowl layer. Congrats on the the winning ^_^ I liked Kokeishi bento boxes too!